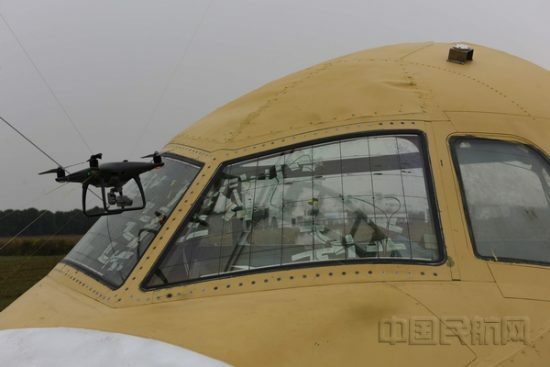 On November 30, the Civil Aviation Administration of China (CAAC) conducted the first test of a collision between a UAV (drone) and a passenger plane at the Xiangbei Experimental Base of Aviation Industry. This was done to determine the effects of a quad-copter drone hitting the front windshield of a passenger plane in flight. For the test, an aircraft nose section was manufactured. The mock-up was not based on an actual aircraft model but similar to a domestic jetliner. Two DJI quad-copter drones were then positioned to hit the windshield. One test involved hitting the corner of a windshield, the other dead-center. The speed of the aircraft was described as ‘typical’. Both outer cockpit window panes cracked as a result of the collision, photos show.